Last year, we reported that the Wikimedia Foundation and PediaPress had partnered to allow you to assemble your own wiki pages from Wikipedia and print them out in book form. Today, the feature is being extended to the English language and all U.S. users. Previously the ability to create books from the English version of Wikipedia was exclusive to signed in users, because of scalability issues. But now anyone can create books from the over 3 million articles on Wikipedia in English alone. Users can create the book without leaving Wikipedia. A “create a book” button has been added in the print/export section of Wikipedia‘s left navigation sidebar that brings them to the book creator. When you browse the site, you can add articles to the book by clicking the “Add the Page” button. give the book its title and an editor‘s name. 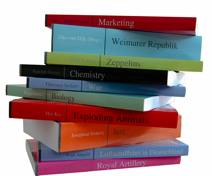 The price of the unique books depends on the number of pages and starts at $8.90. Books are ready for shipment within two working days. The Wikimedia Foundation receives (only) 10% of the gross total for each book sold. But this could be a profitable revenue maker for Pedia Press considering the enormity of the English and U.S. market.